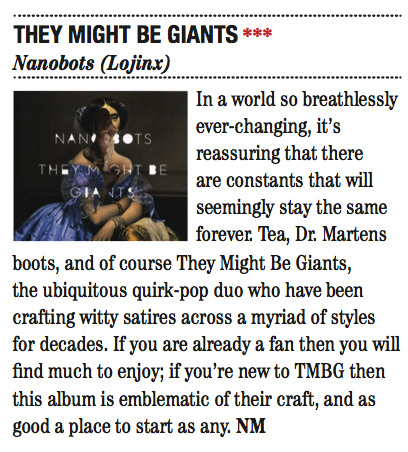 "A dependably enjoyable set of bulky, countrified rock songs"
"a moment of celebration when she announced a new album"
5/5 - "after 30 years they are still more than capable of stirring that teenage sense of enthusiasm in their audience"
"They Might Be Giants are arguably one of the most well-respected and successful bands ever to emerge from alternative rock... Nanobots, showed us that the band is far from running out of steam"
"another triumph in catchy songwriting that holds plenty of substance musically and lyrically"
"in a world where many acts fail to produce anything truly original TMBG should be applauded for following their own unique path"
"Leftfield indie stalwarts pull another clutch of vibrant, accessible tunes from their bottomless creative sack"
"Nanobots is an interesting, different offering. At times satirical, at others droll, but always quirky and fun." "you wonder what they’d have to do to gain the kudos they deserve"